A Billboard You Can Afford. Be seen by thousands of motorists & pedestrians at eye level at an affordable cost. 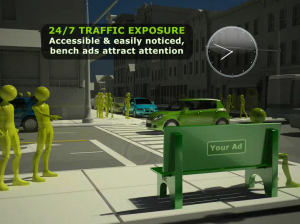 Accessible and easily noticed, bench ads attract attention and get 24/7 traffic exposure. We can help you create an effective design that will get noticeable results for your business at no additional charge. Over the years, I’ve gotten two to three new clients each week directly from my ads. Welcome to Bench Billboard Company serving your advertising needs in Ohio, Michigan, Indiana, and Kentucky with 1,000s of street-side benches that can target and impact your customers 24-hours a day. You may know them as park bench ads, bus stop advertising or evenmini-billboards, but they all describe an advertising medium that works, bench billboards. For over 50 years, Bench Billboard Company has provided communities the needed amenity of bench seating in public areas, and for its customers, Bench Billboard Company has provided excellence, affordability, and location, location, location. See what our clients, from small businesses to large companies, have to say about our service and the effectiveness of sponsoring bench billboards as a key element of their advertising/marketing campaigns on our Testimonial page. For examples of bench billboard art, check out our Gallery page. Bench advertising is easy because Bench Billboard Company handles all the work, from ad consultation and design to production and maintenance. Typically, a bench ad will be posted within 3 to 4 weeks of having Bench Billboard set up your campaign. Contact Bench Billlboard Company today for bench ad locations in your market and put the power of “A billboard you can afford” to work for your business.